Keep your Cashmere Constantly Contented! Wear your Woollens Weekly Without a Worry! The Caraselle Deluxe Knitwear Care Pack is here for ALL your knitwear needs - we've got you (literally) covered! Our Fantastic New Pack makes a great Stocking Filler for someone who loves their knitwear! If purchased as separate items would cost £ 37.22. Save over 30% @ £ 19.99! Our best selling Lint Roller removes fluff, lint and other debris, our Defuzzer Comb and Shavers removes Bobbles. Once your jumpers are looking fabulous, KEEP THEM THAT WAY! 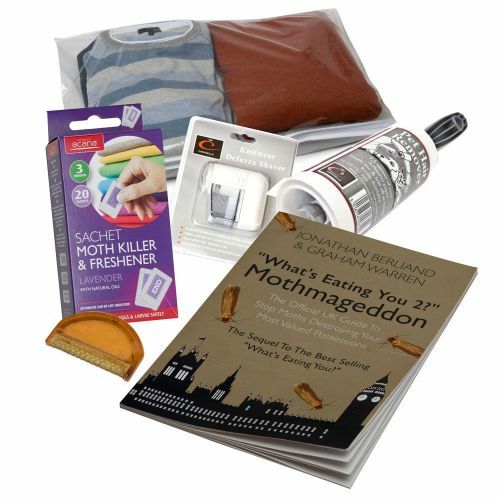 This is so easy to do with our Knitwear Storage Bag and Acana Moth Killer Sachets, giving your knitwear the best protection against moths, dust and damp. Spoil yourself or a loved one this Christmas with the Caraselle Deluxe Knitwear Care Pack - and save money at the same time! What could be better?